Powers/Abilities: Skilled fighter, trained acrobat. Strength, endurance and speed at height of normal human capability. Bucky often armed himself with a machine gun (at least in the Golden Age). History: (ga) James Buchanan "Bucky" Barnes was an orphan assigned to U.S.Army Camp Lehigh, where he was treated by the men as the camp mascot. One day he walked in on his friend, PFC Steve Rogers, changing into his Captain America costume. Naturally he agreed to keep his pal's secret, and shortly afterwards Rogers decided to make the resourceful youth his sidekick after he had helped him fight the Red Skull. As Bucky, he fought against gangsters, enemy agents and Fifth columnists. 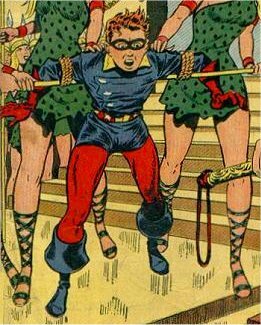 (sa) In 1941 Bucky was one of the original members of the newly formed Invaders, and a year later he helped create yet more hero teams, the Liberty Legion and Kid Commandos. 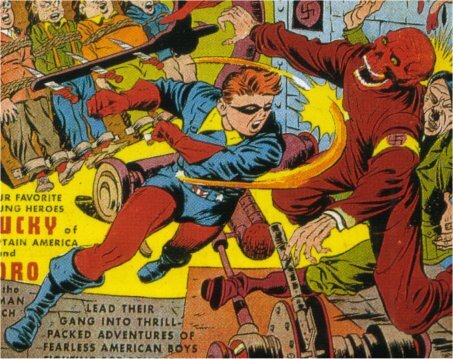 (ga) Later he teamed up with the Human Torch's sidekick Toro and some other resourceful kids to form the Young Allies. (sa) Near the end of World War II he and Captain America were assigned to guard an airforce base in southern England. Baron Zemo attacked, and captured both of them. They awoke to find themselves strapped, about to be sent to Berlin on board the experimental plane they had been meant to protect. They broke free just before it took off, and raced after it on a motorbike, hoping to board it and prevent it falling into enemy hands. As it lifted from the ground, both men leapt for it, but only Bucky got a firm grip. Realising the plane might be boobytrapped, and that Bucky could not disarm such a device on his own, Cap shouted to his ally to jump clear, but before he could so it, the bomb detonated, killing Bucky instantly. His body fell into the English Channel and was never recovered. Comments: In the 1940s and 1950s (the "Golden Age" of comics) Bucky's adventures continued on unabated. To compare the Golden Age version of Bucky with the retconned Silver Age version, ignore the mention of the Invaders and his death near the end of the war, and add in all the Golden Age exploits of the two Bucky's below - until the Silver Age changed things, this was all the story of a single character. History: (Marvel Premiere #30) In 1942 Fred Davis was a bat boy for the New York Yankees. The Invaders had been captured and brainwashed, leaving only Bucky free. As part of a plan to capture the mind-controlled heroes, Bucky asked Fred to impersonate him, which the patriotic lad did without hesitation. (What If? I #4) Three years later, as the war was drawing to a close, Bucky and Captain America were reported killed. President Truman realised the news of their deaths could be a severe blow to Allied morale, and so he requested that Fred once more wear the costume (while the Spirit of '76 become the new Captain America), and operate alongside the Invaders to maintain the pretence that America's premiere heroes were still alive. (Captain America Annual #6) In June of 1945, just before the war ended, the new Bucky accompanied the Invaders on a mission to Japan to destroy a prototype solar-powered tank. (All-Winners Comics #19, ga) Alongside the All-Winners Squad, Bucky fought Isbisa, who was trying to commit "the crime of the ages". (What If? 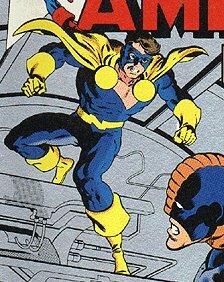 I #4) Bucky was present when the android Adam II attempted to assassinate a young and up-coming politician, a fight in which one Captain America lost his life (the Spirit of '76), and another took up the mantle (the Patriot). (Captain America Comics #59-65, ga) No synopses available. (Captain America Comics #66, ga) Fred was shot by Lavender, and although he survived, he was forced to take a break from adventuring while he recovered. (Captain America Comics #71, ga) Fred briefly returned to active duty as Bucky for the space of a single adventure. (bts) The All-Winners Squad disbanded in 1949. Fred meanwhile began to use a cane, as his wound had left him with a limp. (Citizen V and the V-Battalion #1, fb) In 1951 Fred agreed to become a member of the V-Battalion, becoming one of the ruling Penance Council. (Citizen V and the V-Battalion #2, fb, bts) Fred presumably attended the funeral of Union Jack (Brian Falsworth), who had died in a car crash. (Thunderbolts #40, 49, Citizen V and the V-Battalion #1-3, Citizen V and the V-Battalion: Everlasting #1-4) No synopses available. Comments: The exact changeover point between Bucky (Barnes) and Bucky (Davis) isn't clear, since of course originally there was none. However, if we take the changeover point as being some time in 1945 (as stated in What If? I #4) and match that to corresponding real world cover dates of Captain America Comics, then we get a run of issues between #44 and #51 as our options. There's nothing really to support this, but in the absence of something better, its as good a way of figuring it as any other. Powers/Abilities: Excellent athlete and acrobat, skilled fighter. His body is at the peak of human fitness thanks to his exposure to the super-soldier serum. History: (Captain America I #234) Jack Monroe was an orphan with an obsession about Captain America and Bucky. He discovered his history teacher had a similar fascination - so much so that he had uncovered army documents providing details of his hero's true identity, and had then changed his own name to Steve Rogers. Rogers had also uncovered information which he believed would allow him to duplicate the Super-Soldier serum. All of this he shared with Monroe. The two eagerly decided to adopt the costumed identities of their two heroes, and took the serum. Their physiques were enhanced to the peak of human fitness, but what neither realised was that the notes missed out a vital component, "Vita-Rays", which stabilised the process. Without these, both Rogers and Monroe gradually began to become paranoid and insane. (Young Men #24, ga) The (new, communist) Red Skull took the U.N. hostage, and Captain America and Bucky made their debut to rescue the delegates. (Young Men #25, ga) No synopsis available. (Young Men #26, ga) Bucky was horrified when Captain America appeared to endorse communism, until it proved to be a ruse on his part to draw out a traitor who had tried to brainwash him. (Young Men #27, ga) No synopsis available. (Young Men #28, ga) Captain America and Bucky tackled dope smugglers. (Captain America Comics #76-77, ga) No synopses available. (Captain America Comics #78, ga) The pair faced Electro, a superpowered Russian assassin. (Captain America Annual #13) Shortly afterwards Captain America and Bucky had a rematch with both Electro and the Red Skull. (Captain America I #153, bts) Captain America and Bucky's paranoia grew, and the pair began to act increasingly irrationally. (Captain America Annual #6) By July 1954 they were attacking people virtually at random, in the belief they were Communists. (Captain America I #153, bts; Marvel: The Lost Generation #1) By 1955 the FBI had captured both men, and frozen them in suspended animation. (Captain America I #153-156) The two were awoken in the modern day, and sent to fight the man who had originally inspired him: the Captain America of W.W.II had himself been awoken from suspended animation. Both were eventually defeated; the 1950s Captain America committed suicide, while Bucky went completely insane. (Captain America I #281-288, 290, 292-307, 309, 325, Nomad #1-25) Jack was cured of his insanity and became an ally of the real Steve Rogers. 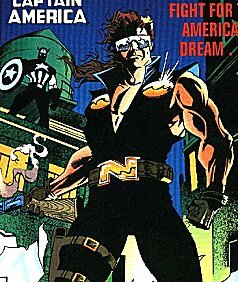 Jack dropped the Bucky identity and became Nomad, eventually striking out as a solo hero. However he was nearly killed by an explosion, and returned to suspended animation to preserve his life. 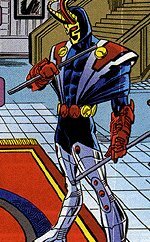 (Thunderbolts I #34-50) Jack was revived and brainwashed by the government into becoming the assassin known as the Scourge of the Underworld. Eventually he broke free of the conditioning, and vanished. Comments: In the 1950s, when the original Young Men Comics and Captain America Comics #76-78 came out, this was of course meant to be the original Bucky. In the 1960s when the original Captain America was revived, and Bucky revealed to have died in 1945, an explanation eventually had to be found to explain who had starred in these comics - rather than simply wipe out these adventures from the Marvel Universe entirely, the option of them being the tales of another Captain America and Bucky was taken...and this in turn led to the story of their return to action.